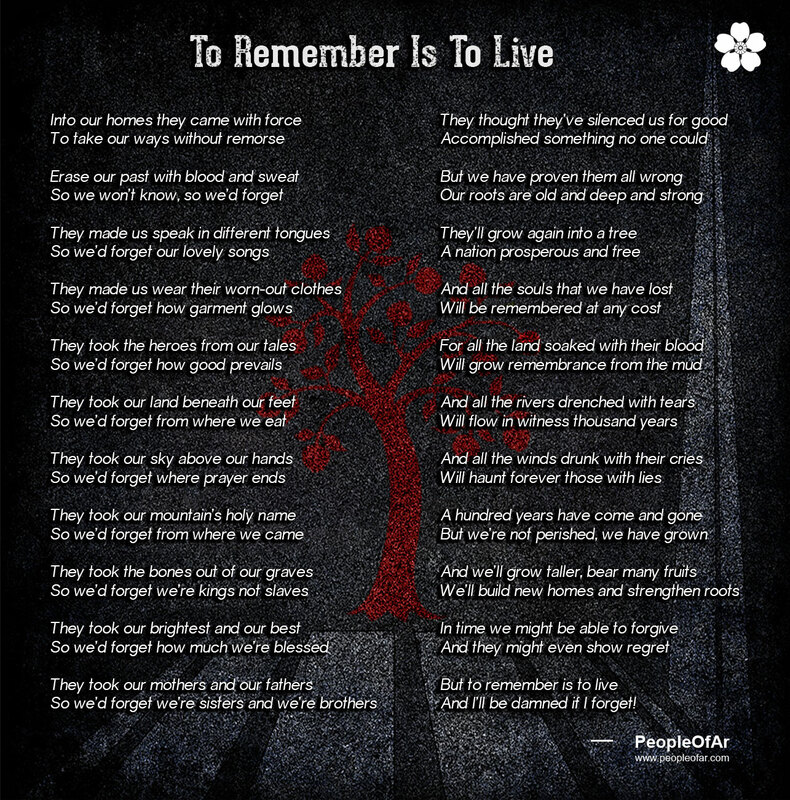 Home » Armenian Genocide » To Remember Is To Live! To Remember Is To Live! In the light of the centennial commemoration of the Armenian Genocide I’ve decided to write a poem. I’m not much of a poet, but this comes from the heart. Enjoy! And I’ll be damned if I forget! What do you mean “I’m not much of a poet”? This is one of best I have read. Indeed this comes from your heart and it will be touching many harts as it touched my heart. On the centennial of the Armenian Genocide, it is very timely and inspiring. I hope to see more poems from you. Thank you Hrair! Much appreciated! That’s a powerful poem, written from the heart. Rise up, Armenians, your God has not forsaken you! Written so well, and with perfect rhyme, that’s real talent!! Remembering my English professor in college. Thank you so much for your wonderful compliment! This is a beautiful piece and written so well! I am wanting to cite your poem in my university paper regarding poetry surrounding the Jewish and Armenian genocides. Are you able or willing to contact me via email in regards to getting the proper information for me to cite you properly? Many thanks. Thank you for your kind words! You can contact me on peopleofar@hotmail.com with specific questions. I will be delighted to provide you with the information you need.